Το έργο υλοποιείται στο πλαίσιο της Πράξης "ΑΡΙΣΤΕΙΑ Ι" του Επιχειρησιακού Προγράμματος «Εκπαίδευση και Δια Βίου Μάθηση» του Εθνικού Στρατηγικού Πλαισίου Αναφοράς (ΕΣΠΑ) και συγχρηματοδοτείται από την Ευρωπαϊκή Ένωση (Ευρωπαϊκό Κοινωνικό Ταμείο-ΕΚΤ) και από εθνικούς πόρους. Το παρόν συγχρηματοδοτήθηκε από την Ευρωπαϊκή Ένωση (Ευρωπαϊκό Κοινωνικό Ταμείο) και εθνικούς πόρους στο πλαίσιο της πράξης 'ΑΡΙΣΤΕΙΑ' του Επιχειρησιακού Προγράμματος «Εκπαίδευση και Διά Βίου Μάθηση». During the period January 2009-December 2010, the Research Team of the Laboratory of Modern Greek Dialects, (LMGD, University of Patras) has conducted a research on the dialect of Megara, funded by the research project ‘From the Dialect of Megara to the dialect of Old Athenian’ (project code: C612, Leventis Foundation. Coordinator: Prof. A. Ralli). The present thematic volume of Patras Working Papers constitutes a special collection of papers, which reflects the results of this research project. Since LMGD aspires to serve as a link between the scientific and the local communities for the preservation of their linguistic and cultural heritage, we hope that the present volume will contribute significantly towards this direction. 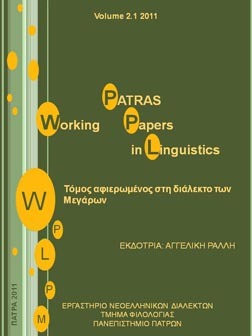 The first volume of PWPL is dedicated to Morphology, and exhibits the results of research, which has been carried out within the framework of the graduate program of Comparative Linguistics and Language Variation, in the period 2006-2008. 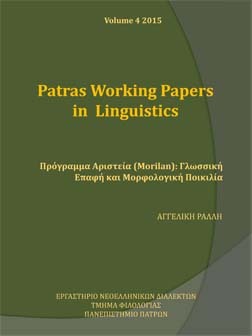 Most papers concentrate on Greek, but there is also a paper on Bulgarian. The description and analysis of data illuminate recent and older stages of the language, its computational treatment and aspects of its dialectal variation. To that end, written and oral corpora of the Centre of Modern Greek Dialectshave been used. The topics of this volume are hot issues for morphological theory: the demarcation of compounding and prefixation, the role of constraints in compound formation, the development of coordinate compounds, neoclassical compounding, evaluative morphology, agentive suffixation, and borderline cases between morphology and syntax.